Called the Westcott Rick Sammon On-Location Lighting Kit and Tote, this affordable and practical accessory makes it easy for anyone serious about outdoor portraiture to turn snapshots into great shots. 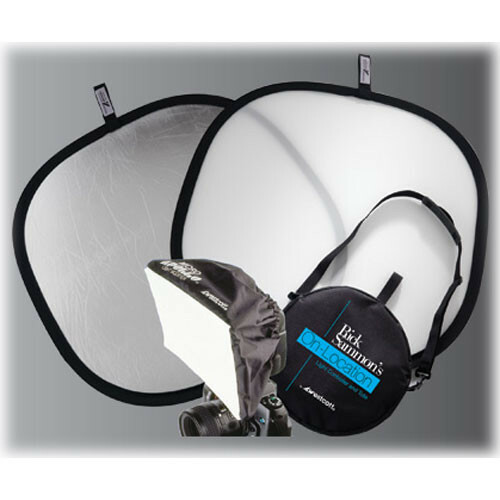 This kit includes a 12" diameter lightweight tote, a 30" Diffuser, 30" Silver/Sunlight Reflector, and a Micro Apollo that attaches to any on-camera accessory flash. The Micro Apollo eliminates red-eye, brightens colors and softens harsh light from your flash. The lightweight frame also functions as a gel holder. It is easy to install and remove, and tucks away into a corner of a camera bag. No disassembly is required to close the reflectors. They fold to a small, hand-held circle one third their original size. High-carbon steel frames are riveted, to stand up to use. Box Dimensions (LxWxH) 12.5 x 12.0 x 3.0"
Rick Sammon On-Location Light Control Kit is rated 5.0 out of 5 by 8. Rated 5 out of 5 by SLH from Excellent light control kit The best thing is that this kit is portable, and easily connects to your camera bag. I have used it for adding fill-light to portraits and it has been very useful. It is extremely versitile and in a small compact package. The kit was very useful in adding lighting to the subject was properly lit for the shot. Rated 5 out of 5 by Taconite from Simple, straightforward and it works. Everything arrived in perfect working order. The product is well made and from experience, I know will last me for years to come. If you shoot on location and need a basic lighting and fill kit, this is something you should consider having in your arsenal. Rated 5 out of 5 by Anonymous from Best Outdoor Light Control kit I use this product during my outdoor photo session. The product is compact when store in the provided tote and you can feel the quality of the product when you use it. Noting negative about the product except the heavy price tag. Rated 5 out of 5 by Creator'sClick from It's A Cool Kit Looked around for a while and found this to be a great start. Definitely a good kit to take with you. It's kind of on the smaller side and recommend getting a bigger reflector to compliment it. Rated 5 out of 5 by Bullish from really handy I like having all three products fold up so small and being able to carry them so easily in the bag. Very handy. I know I will use them a lot! Rated 5 out of 5 by MrBurbee from Excellent value Use it to diffuse on camera flash and to control contrast in various situations especially outdoor location shots. great product. Rated 5 out of 5 by Stu from Great Portable Kit Product is great for probability. Easy to carry. The Micro Apollo works good for softening harsh light with your flash. Rated 5 out of 5 by Baldielocks2006 from On location Light Control Kit This kit is awesome for shooting portraits outside. I have used it a ton since I bought it! Very usefull tool!